One aspect of the undercover policing scandal that has waned from public attention is the use of the identities of dead children by undercover officers. It wants looking at because the police's stated reasons for doing it don't bear scrutiny and in fact contradict one another. I'll explain more about that in tomorrow's post, but for now let's go over what happened. In the earlier days of the political secret police unit the Special Demonstration Squad - from the late 1960s to the 1990s - officers would go on 'the Jackal Run'. Named after a technique made famous in Frederick Forsyth's 1971 novel The Day of the Jackal, they'd trawl the registers of deaths looking for someone who had a similar birth date who had died young. They also needed the child to have the same first name in order to preserve their cover, as there's an instinctive way you respond when called out to by name. They'd look for a surname that wasn't unusual but wasn't too common either, such as Robinson, Daley or Barker. Offiicers didn't just use the name, they resurrected the identity. They would visit the town and home of the child to familiarise themselves and so help build a backstory full of genuine details. It gave their stories an authenticity that would be crucial if they ever happened to meet someone from their supposed home town. This isn't merely distasteful and ghoulish. As Anthony Barker - whose brother John Barker died aged 8 of leukaemia aged 8 before his identity was stolen by police officer John Dines - pointed out, it puts bereaved families at risk. After Dines ended his deployment and disappeared, his worried and bereft activist partner Helen Steel traced John Barker and went to the house listed on the birth certificate. Now, imagine that policeman had infiltrated a violent gang or made friends with a volatile person, then disappeared, just like this man did. Someone wanting revenge would have tracked us down to our front door – but they wouldn't have wanted a cup of tea and a chat, like this woman says she did. One of my former activist mates was Rod Richardson. After we exposed Mark Kennedy, we realised Rod fitted the same mould. I went looking and found his birth certificate. Unlike Kennedy, it was in his real name. For a second I had a flash of guilt that he was real, that we'd suspected a genuine comrade of betraying us. Then I looked him up in the death register. Rod Richardson had died aged two days. Our friend was actually a police officer. The night we'd celebrated his birthday with tequila and sledging over black ice on a tea tray to the karaoke in the pub wasn't his birthday at all. It will have been a very sombre night indeed for the real Richardsons. The police know this identity theft is morally indefensible. A few days after we published details of Rod, Pat Gallan - Deputy Assistant Commissioner of the Met and, at that point, head of the police's profligate arse-covering self-investigation Operation Herne - gave evidence to the Home Affairs Select Committee. Gallan said that they had found a solitary case of dead child ID theft but the combined efforts of Herne's 31 staff had failed to find any more in the subsequent five months until we came forward with the evidence of Rod. Gobsmacking incompetence or reluctance to admit the embarrassing truth? You decide. Either way, she was removed from Operation Herne four days later. Showing what Operation Herne can actually do with that sort of time period, five months after Gallan's brassnecked performance, in July last year, Herne published a report on the topic of dead children's identity theft [PDF here]. Of the 106 fake identities used by SDS officers, it had found that 42 were of dead children, 45 were fictitious and 19 were unknown. It said that identities were stolen from the early 1970s and used for more or less every officer until November 1994, with instructions given in detail in the SDS Trade Craft Manual. It is absolutely clear that the use of identities of deceased children was an established practice that new officers were ‘taught’. It was what was expected of them, and was the means by which they could establish a cover identity before they were deployed. So much for Pat Gallan's one isolated case, then. The SDS apparently phased it out in the mid 1990s. But it seems that when the new National Public Order Intelligence Unit was set up to do similar work in 1999, they initially used this anachronistic tactic. As he was deployed the same year the NPOIU was set up, the officer who stole Rod Richardson's identity must have been one the first NPOIU officers, if not the very first. 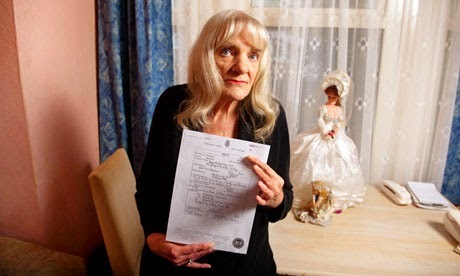 The real Rod Richardson's mother, Barbara Shaw, made a complaint to the police. It was referred to the Independent Police Complaints Commission in February 2013 and they handed it back to the police but said it would be a 'supervised investigation'. It was then downgraded to a straightforward police self-investigation known as Operation Riverwood. When it was completed the police announced that no action would be taken against any officer. They are still refusing to publish the investigation's report. The families of the dead children whose identities have been stolen by the undercover officers deserve better than this. They deserve an explanation, a personal apology and, if appropriate, a warning of the potential risk they face, in the exceptional circumstances, that their dead child's identity was used to infiltrate serious criminal organisations. The harvesting of dead children's identities was only one manifestation of the rot at the heart of these undercover units which had officers lie on oath, conduct smear campaigns and use sexual relationships as an evidence-gathering tool. Ms Shaw has told me that she feels her complaint has been swept under the carpet. Families need to hear the truth and they must receive an apology. Once families have been identified they should be notified immediately. We would expect the investigation to be concluded by the end of 2013 at the latest. The police have ignored it. A number of bereaved families contacted police to ask if their child's identity had been used. Police refused to answer. A Freedom of Information request was made asking for the ages of the dead children, not even the exact dates or their sexes. At least with that barest detail, many worried families would be able to rule out their children if there wasn't a match. The police refused to do even that. Last month the Information Commissioners Office declared that the police must release the list of ages. It is not yet known if the police will appeal that decision. But, as they've shown in the legal battle with the women who were subjected to prolonged psychological and sexual abuse by the secret police units, they will take any opportunity to withhold information, avoid accountability and deny justice.